Fizz Free February is coming! By committing to go fizz free for the month of February, it will make it easier to cut down on fizzy drinks for the rest of the year. Sign up below to go fizz free this February! kiwi and apple to make the water taste and look more interesting. milk, water, sugar-free or no added-sugar drinks. Download a water tracker app and mark off the glasses of water you drink per day! the more likely you are to use it! Energy drinks aren’t suitable for those under 16 as they can contain a lot of sugar and caffeine. Having energy drinks may be linked to difficulty sleeping, headaches and anxiety. 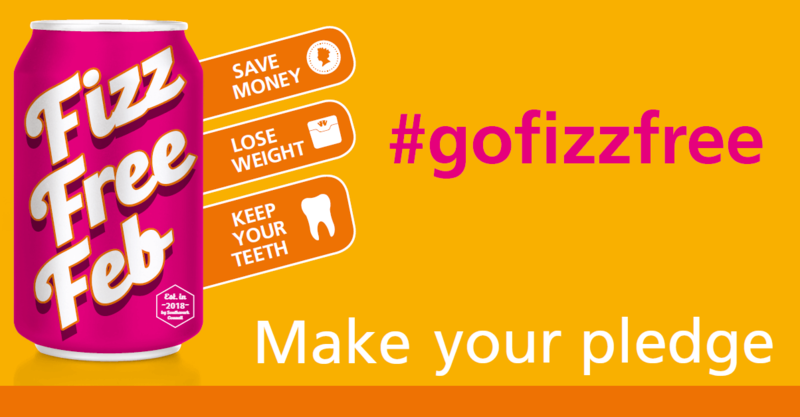 Ready to make your pledge to go fizz free this February?